Now you have been to most of the major tourist attractions in Paris and spent hours lining up for Eiffel Tower, admiring Mona Lisa at the Louvre. What is there to do on your second visit to Paris? Last month we visited Paris for the 2nd time and we definitely had a hard time deciding where to go. York only visited Europe last year and my last visit to Europe was 15 years ago. I wanted to visit the major attractions again to take photos as a grown-up, but part of me couldn’t be bothered lining up for hours. Paris was a short 72 hour stop for us before we headed to Morocco. We ended up settling on things we both never done before (except for one attraction). It is good to be back the second time! 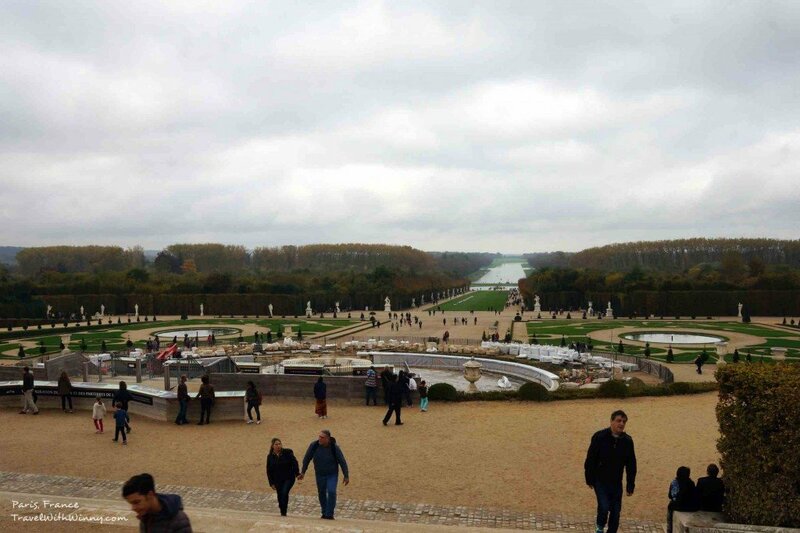 Personally I reckon Palace of Versailles is one of the must-visit for first timers in Paris, together with the Louvre, Arc de triomphe and the Eiffel Tower. Everyone seems to put Notre Dame on the must-see list, however I really don’t think it is that spectacular, there are a lot of other amazing churches in Europe. York was one of those tourists last year, he did not leave the Paris city center and had not heard of Versailles before (shock horror!). 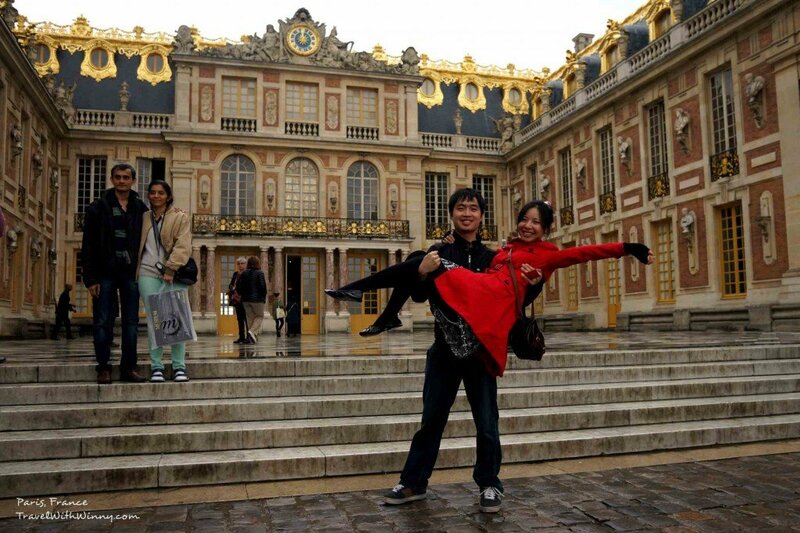 I have visited Versailles when I was a kid, I really wanted to show York why this place is so popular! The huge line for the main château. Impressive golden gates. The Palace of Versailles, also known as The Château de Versailles, is located 20 kilometers southwest of Paris. It is easily accessible by 35 minute train ride- RER C5 line, direction Versailles Rive Gauche (trains called VICK or VITY), get off at Versailles Rive Gauche station. To avoid the long queue, it is advisable to arrive as early as possible. Even though we were there first thing in the morning, we still waited for about an hour to get into the château itself! The château is not open to the public on Mondays, it is important to know this in advance when planning your trip. Take the Queen back to her Palace! 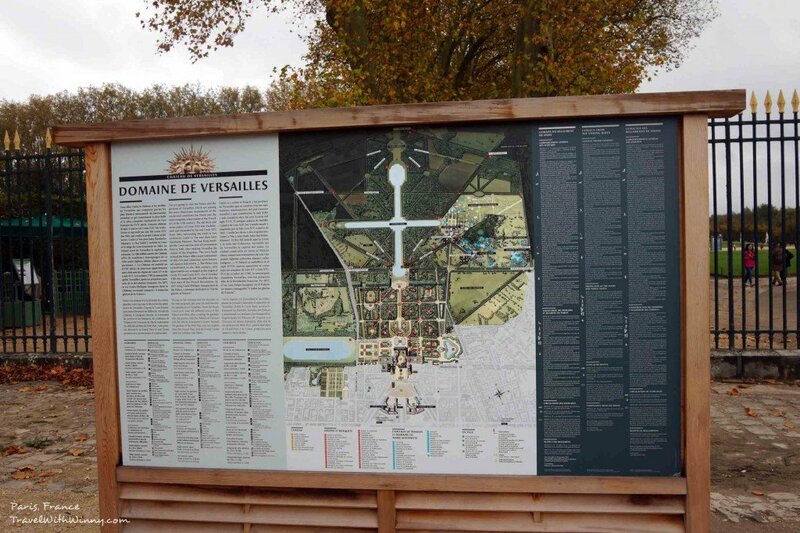 A brief history on Versailles: it was the centre of French political power from 1682 when Louis XIV moved from Paris until the beginning of French Revolution of 1789 when the royal family was forced to move back. 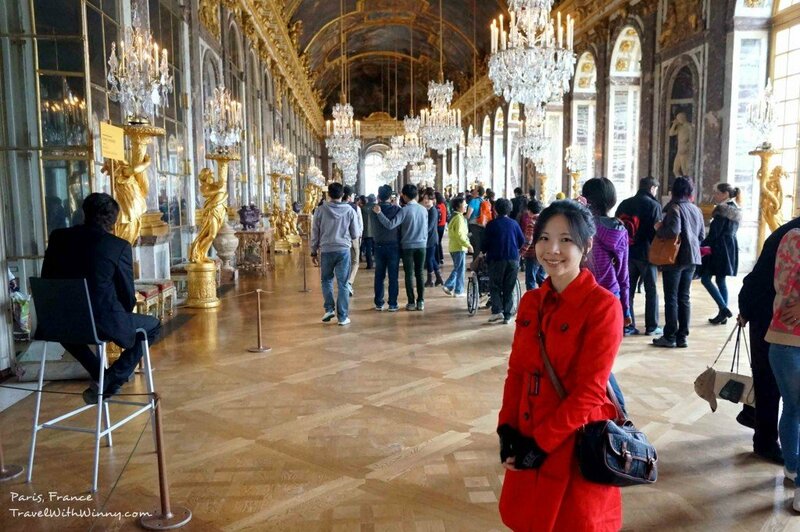 One of the famous rooms in the château was “The Hall of Mirrors”, it was where the Peace Treaty was signed between defeated Germans and the Allies that ended the First World War in 1919. Within the main château you can visit different chambers and bedrooms, experience the luxury living of Marie-Antoinette (there are tours that allows you to dress up as Marie-Antoinette and take memoriable photos within Palace of Versailles. 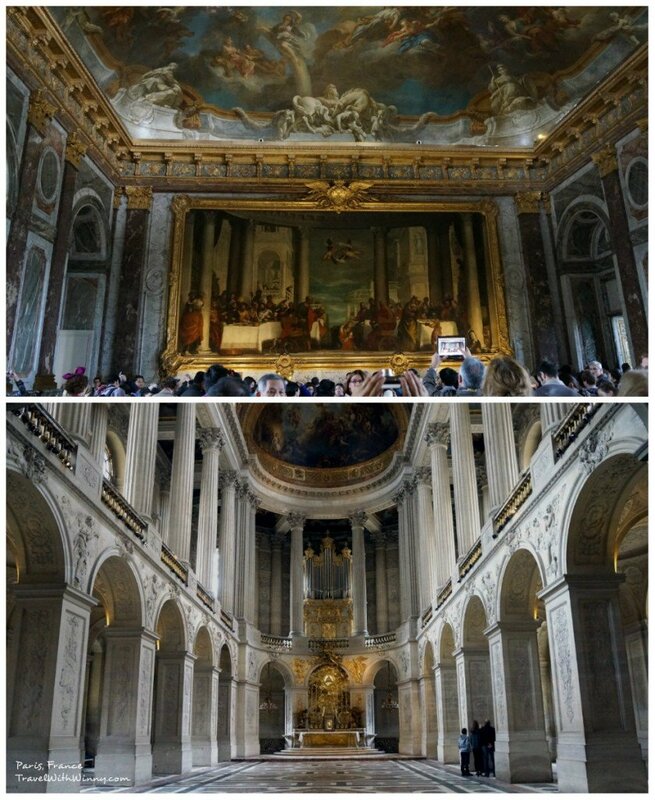 From my opinion, if you are not into French history, it takes about an hour to finish admiring the main palace. Some of the rooms were so crowded, it was impossible to stop and admire the beautiful furnitures & artworks. I think what really impressed me is the outside of the château. The gardens were magnificent and HUGE! There is a huge grand canal behind the main palace. You can do boat rowing in summer on the canal if you and your partner fancy some romantic moments. In the summer you can also do train ride and cycle hire to explore the massive garden. The gardens were in different sections with different themes, each sections were very well maintained. I can imagine how this place can transform in different seasons. We had a lot of fun taking photos at different spots. 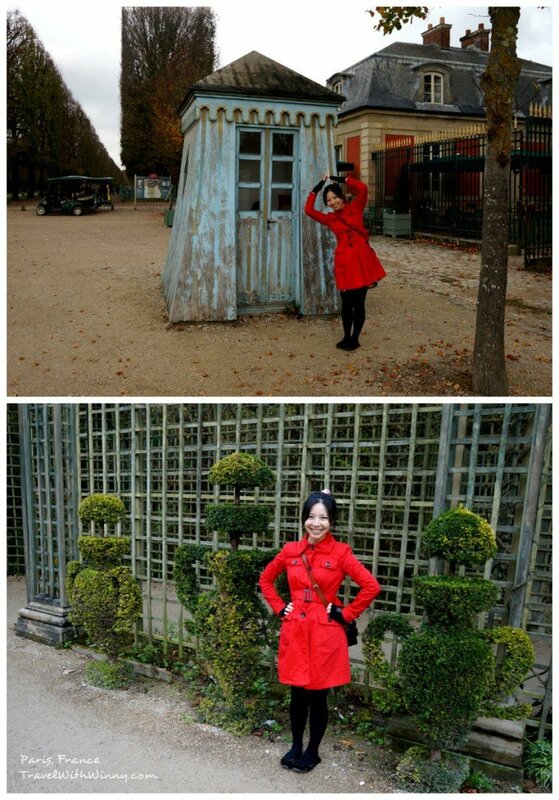 There are actually other estates within Palace of Versailles. Each residence is around 30 minute walk from the main palace. You can purchase Château-only tickets or Marie-Antoinette’s Estate and Grand Trianon-only tickets or One-Day Pass (all inclusive). Half hour into our exploration of the gardens, I tripped over a rock and my hurt my ankle. I could barely walk at all. The map of the whole place, the main château is at the bottom tip of the map. 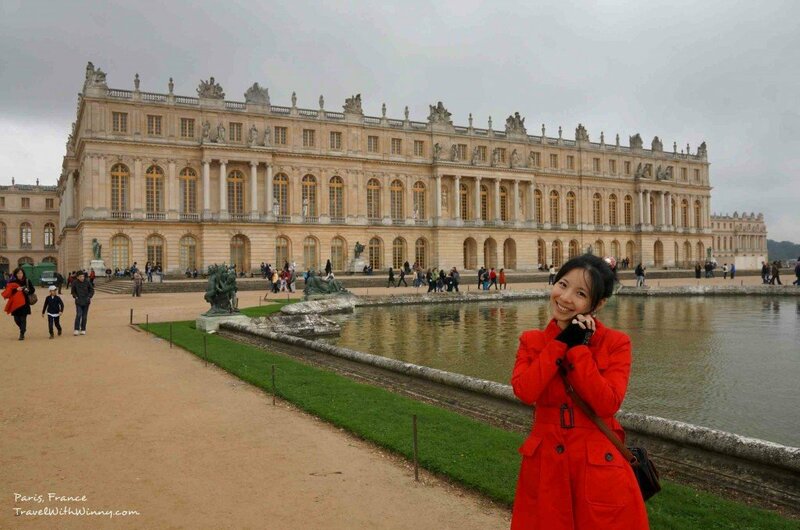 Even though it was possible to hire a golf-style buggy for an hour to explore the grounds (30 euros per hour), I was in too much pain that I decided to come back next time to visit the other residence palaces. Should’ve took a picture to show you guys how bad it was. York thought I had fractured my bone! 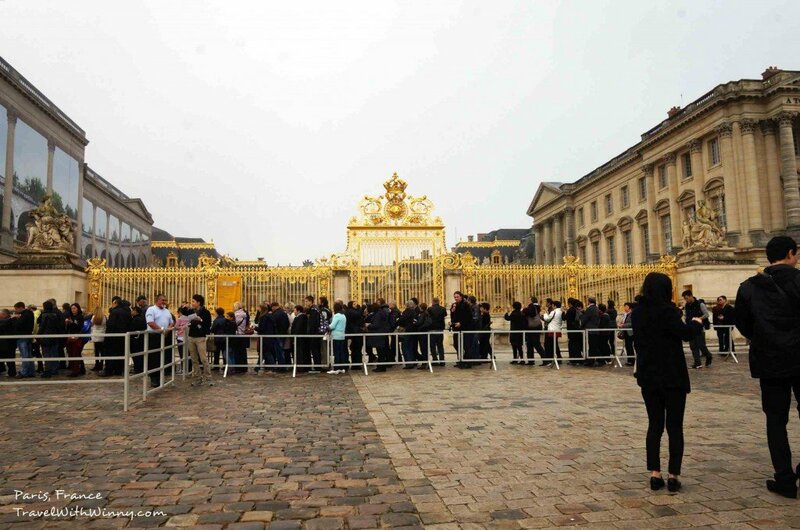 In the future, I will only purchase Marie-Antoinette’s Estate and Grand Trianon-only tickets since I think the château is not worth me lining up for an hour again. There were virtually no lines to get into the garden. I think most tourists would only have time to visit the château. By the time we left the place it was already 1pm. If we were to stay and explore everything, we could easily spend a whole day there. Something to take into consideration when planning your trip. It can be a half day-trip or day trip. All the silly pictures before I hurt myself. Will not do that again next time! Thank you for reading! If you enjoy my blog or find it useful, please like my Facebook Page to get live updates of my trip and subscribe to read my latest posts! Ciao! How to Enter St Petersburg Visa Free?